Get a front row seat to the unfolding wildlife spectacle whilst chilling in the rim flow swimming pool right by the waterhole – you may even be lucky enough to have the elephants come to drink from the pool whilst you’re there! Having just 4 suites makes for an exceptionally personal and intimate stay which is simply not possible in larger lodges. Lee-Anne’s friendly and motivated team pulls out all the stops to ensure happy guests! Pity the standard Suites don’t have outdoor showers like the Honeymoon and Family Suites do – they really are one of our very favourite room features! there’s always a lovely shaded seating spot to be found where you can lounge about in the stylish yet comfy seating provided – it’s a gorgeous space with the welcoming shade provided by magnificent Jackalberry and Leadwood trees! 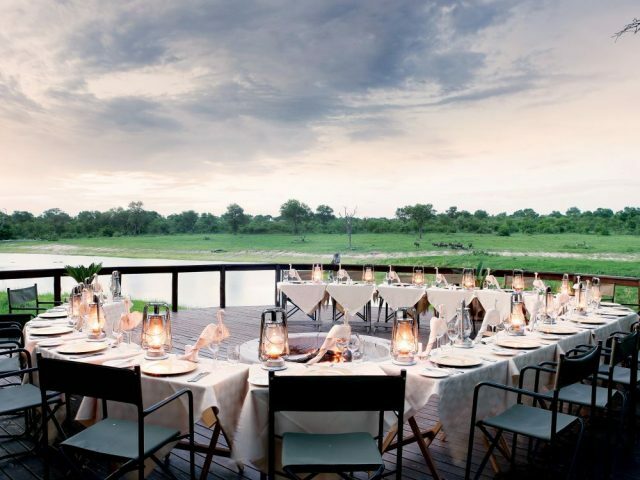 Klaserie Sands River Camp is located in a strikingly beautiful spot along the banks of the Ntsiri River. In fact, it was ironically the river that led to the birth of this stunning new camp, as the old camp was all but washed away by a flood that caused massive damage in the region generally back in early 2012. Three years later the revamped Klaserie Sands River Camp was opened and immediately jumped to the head of the pack of lodges in the Klaserie for style and luxury! The lodge sits picturesquely beneath the shade of the iconic Jackalberry and Leadwood trees that line the river banks. 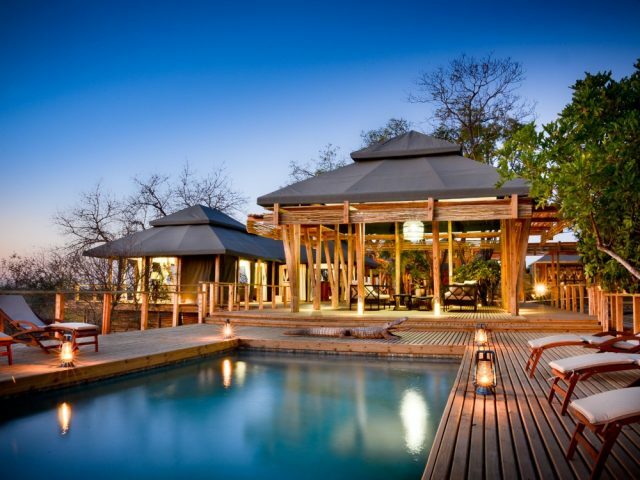 The first thing that strikes you on arrival is how the lodge appears as a lush green oasis in the often dry and dusty bush of the Klaserie with its garden of green lawns and large trees. Then you walk through the lodge onto the gorgeous shaded deck and swimming pool and are confronted with the stunning view out over the dry river bed to the active waterhole which lies within a stone’s throw of the deck – it’ll be at about that time that you’ll start patting yourself on the back for being such a clever clogs for choosing this particular lodge! That positive impression will only get strengthened as you are ushered along the wooden walkway towards your Suite – there are just 4 of them and they are best described as gorgeous! Traditional grass thatch roofs, cement screeded floors and wooden furniture, cream coloured walls with a chocolate feature panel above the bed and classic white linen on the (frankly enormous) king-size beds combine superbly with throws and scatter cushions in rich tones of red and gold to bring a modern contemporary edge balanced with classy elegance. The large, fully-opening bay doors work wonders in letting in the light and air, effectively blurring the line between inside and out as they flow out onto your private deck where you can while away the hours lounging with a good book as you enjoy the views out over the river bed. There are actually 3 different room types at Klaserie Sands River Camp but they all have the same basic look and feel and with relatively small differences between them. All of them are equipped with air-con (a real bonus in the heat of summer!) 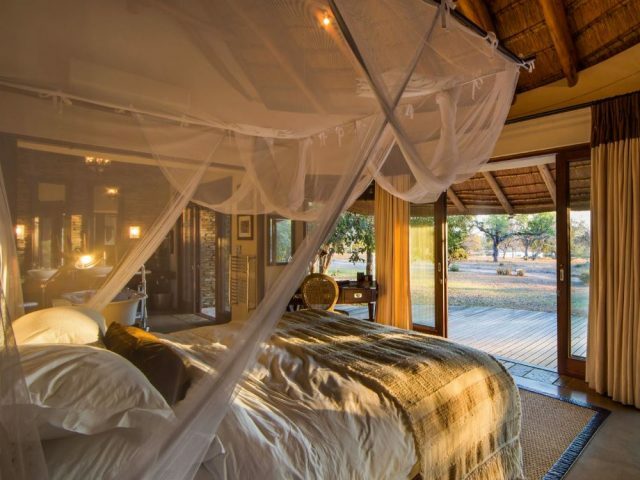 as well as mosquito nets with the Family Suite (with its inter-leading rooms) and the Honeymoon Suite adding a bath and outside shower to the 2 standard Suites offering. But if the rooms are attractive, our favourite aspect of the lodge has to be the main lodge buildings and the gorgeous outside deck area in particular. 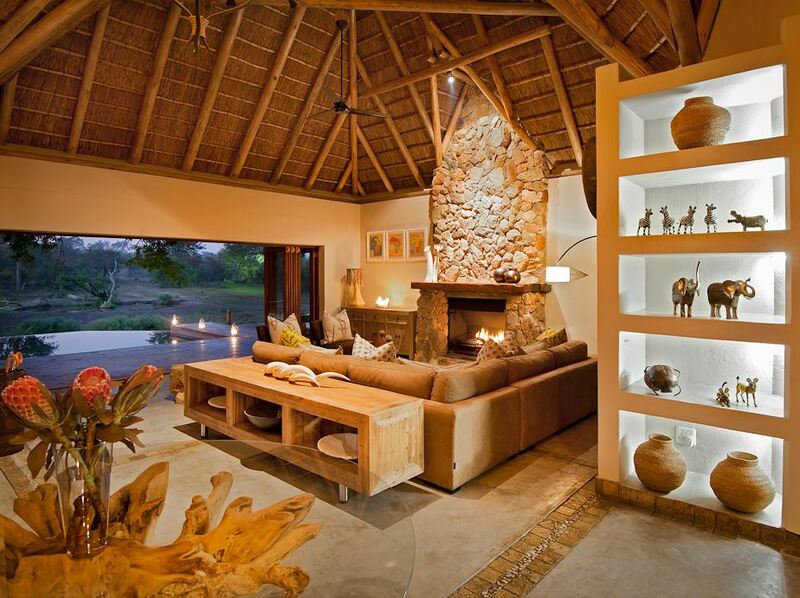 The high thatch roofs make the lounge and bar area feel spacious and airy, whilst a fireplace lined with comfy sofas ensures that things are kept cosy on those cooler winter’s evenings. The décor is stylish, clean and contemporary yet not overdone or fussy and the use of natural elements like old tree trunks and white bleached kudu horns give a lovely warm organic stylishness that prevents things from feeling too clinical. The inside-outside flow seen in the bedrooms continues here in the public areas with the lounge area opening through massive stacking doors out onto the deck and the views of the bush beyond. As we mentioned previously, the extensive wooden outside deck has to be our favourite aspect of the lodge. There’s always a lovely shaded seating spot to be found where you can lounge about in the stylish yet comfy seating provided – it’s a gorgeous space with the welcoming shade provided by magnificent Jackalberry and Leadwood trees! The waterhole is located just across the dry river bed and provides the spectacle of a near constant stream of animals coming down to drink, with herds of elephant and buffalo common visitors not to mention a resident hippo. And if you’re really fortunate you may even be lucky enough to spot the rarer visitors that have been seen popping in for a drink, including leopard and magnificent Sable antelope! 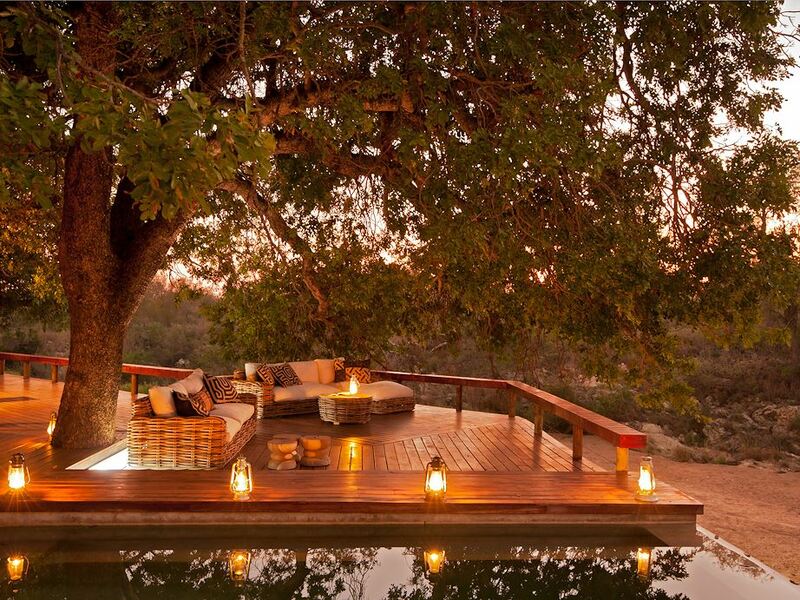 Speaking of wildlife, whilst the deck overlooking the waterhole at the lodge provides for the perfect “sofa safari”, you’ll no doubt be itching to head out on the twice-daily game drives into the Klaserie reserve, at some 60 000 hectares one of the largest reserves in South Africa. Being unfenced neighbours with the Kruger and Timbavati, it offers decent Big Five game viewing opportunities whilst not yet boasting the reputation of the better known Sabi Sand reserve for example. One of the reasons for not being better known is the relatively small number of commercial lodges on the reserve, as for the bulk of its existence it only contained small private-use camps not bookable by the public. The beauty of game drives at Klaserie Sands rests on 2 aspects: firstly the excellence and enthusiasm of the knowledgeable rangers and trackers who go out of their way to providing guests with memorable wildlife experiences; then there’s the fact that unlike the much busier private reserves to the south, here at Klaserie Sands you pretty much have sole access to a massive concession area of some 8 000 hectares, with sightings of other game vehicles being less common than those of the Big Five! This translates into unhurried game drives where you have the unusual luxury of being able to stay at interesting sightings pretty much as long as you wish, as there are no other vehicles waiting impatiently for their turn to see that leopard up the tree with its kill. And if you fancy getting even more connected to the bush, then the guided walking safaris with your knowledgeable ranger is highly recommended. After your game drive, Klaserie Sands is a wonderful place to simply relax and soak up the sounds and sights of the surrounding bush. No doubt you’ll spend many hours lounging in the refreshing pool, whilst spa treatments can also be arranged if you fancy a bit of extra pampering. Talking of pampering, the team at Klaserie Sands under the dynamic guidance of manager Lee-Ann excel in providing genuinely warm personal service with stunning dining experiences also par for the course. The key for us lies in the lodge’s small size – with just 4 rooms Klaserie Sands River Camp is able to offer truly personal and intimate hosting that larger lodges simply cannot.